Technically, meteor showers aren't rare. Every year, a handful of large showers comes through like clockwork, continuing their orbits in a mathematically predictable fashion. And stray chunks and dust hit the Earth's atmosphere daily. Some of this debris brightens a sliver of sky for a fraction of a moment before disintegrating, but a significant portion blinks out without glory. Somehow, even though we know there's nothing cosmically extraordinary about these flaming balls of celestial rubbish -- and we're centuries away from seeing them as signs from the god(s) -- we still look up and think, "Wow! A shooting star!" And unless you're made of stone or generally just too cool for school, you're next thought is usually, "Make a wish!" Because that giddy child in all of us still loves the idea that we're seeing something so special; our inner children still know cool when they see it, and they will always have that over our adult selves. I urge you to let that inner child out to play, and your perfect opportunity to do so is right around the corner. 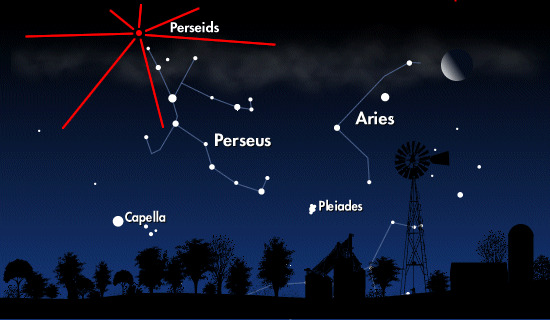 The annual Perseid meteor shower will be upon us from Saturday through Tuesday, and it's my favorite -- not because it's necessarily more visually spectacular than other showers in the northern hemisphere but because it's during the summer when the nights are bearable. It's much easier to lie outside in the open air when it is not ridiculously cold. NASA (and other astronomical organizations) predicts about 60 visible meteors per hour (one a minute!). And though the meteors technically come from the direction of the constellation Perseus, they can be seen at any point in the sky of the northern hemisphere (that's us!). If the skies are clear and there's not too much light pollution then all you really have to do is step outside and look up! But, if you want a more awe-inspiring view, then how about the Kneeland Airport? The Astronomers of Humboldt meet pretty regularly throughout the year for various star-gazing activities. Their meetings, normally held at Kneeland School, are always open to the public, regardless of how experienced a person might be. They don't generally advertise their meetings, but they're listed on their website. The school is equipped with the same Celestron 14-inch telescope as the observatory at College of the Redwoods. So, for nights when star-gazers want to look at a specific celestial body, this observatory really comes in handy. But when you're looking for shooting stars, you want to keep as much of the night sky in your field of vision as possible. This, my friends is where the airport comes in. "Kneeland Airport is very good," says Russ Owsley, president of the Astronomers of Humboldt. We spoke on the phone, and I grilled him for info about the best way to stargaze in HumCo. The Kneeland Airport has an estimated elevation of 2,737 feet, which provides a stellar view of the night sky. The Astronomers of Humboldt will be meeting on August 11 at 8 p.m., but anyone who wants to view the shower during between August 10 and 13 is welcome to head up to the airport. Russ was quick to clarify, though, that while visitors are welcome in the parking lot, they're not allowed on the tarmac (for some reason). The height of meteor madness is usually in the very early morning hours, when the sky is at it's darkest. Russ said this shower will be exceptionally great "because we're at the dark of the moon!" Because it's in its new phase, the moon will be at the smallest, most dim point of it's orbit. Less back-lighting means brighter stars and meteors. Let's summarize this, real quick like. For the cost of gas it takes to go to Kneeland and back, and using the eyes and head you already have, you can watch shooting stars all night. Romantic nighttime picnic? Totally possible. Introduce your kids to the joy of science? Of course. Attempt some nighttime meteor photography? Why the hell not? Your next chance to view a meteor show isn't until October 21, with the Orionids meteor shower. October nights are much colder than August nights, even here in HumCo. So, don't miss this opportunity.